November 19th – Leaving on a jet plane… hopefully! November 18th – How did we make sooooo much laundry??? Dirty… dirty girls…. November 17th – Money, money, money… and noise, noise, NOISE!! November 13th – who needs rest anyway?? November 10th – And we are off… hopefully? October 24th – we are actually veterinarians! October 22nd, 2013 – loving the roosters! August 24th – V.A.S.T. First Annual Family Fun Day! Today was a nice leisurely day… we even slept in until 5:30am! 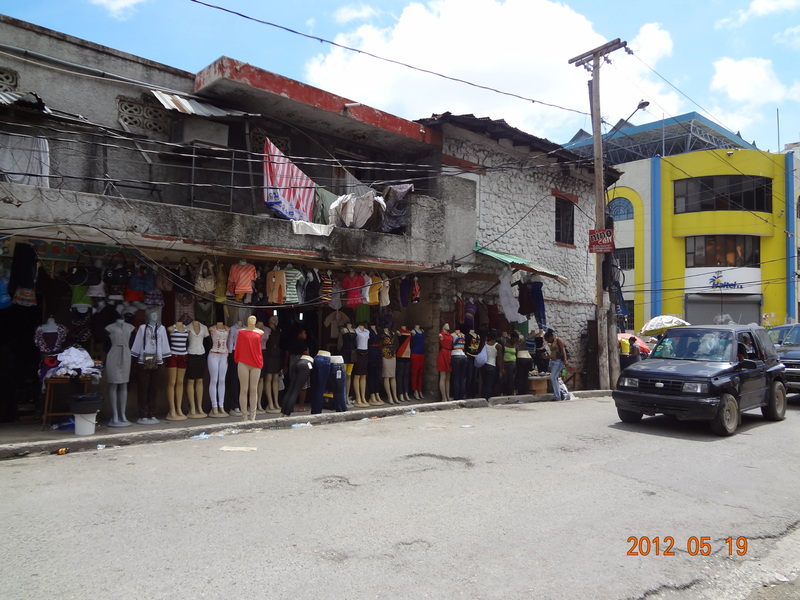 After spending some time over breakfast discussing possible plans for the day, we decided to finish any last minute shopping that we needed to do in Petionville (the ‘ritzy’ part of town). Jasmine had also promised to make Phillip a goat curry, and the market there was the only place in town to get some of the necessary spices. So Pierre Richard arrived and off we went in our taptap… the poor machine had been used and abused by the guy that had borrowed it while we were up the mountain (resulting in a burnt out clutch), and at times it no longer wanted to climb up the hills to the suburb. The day’s dichotomies started on those hills, as fancy cars and trucks passed us at great speed. The first place we stopped was the grocery store, and it was in all honesty a complete culture shock. 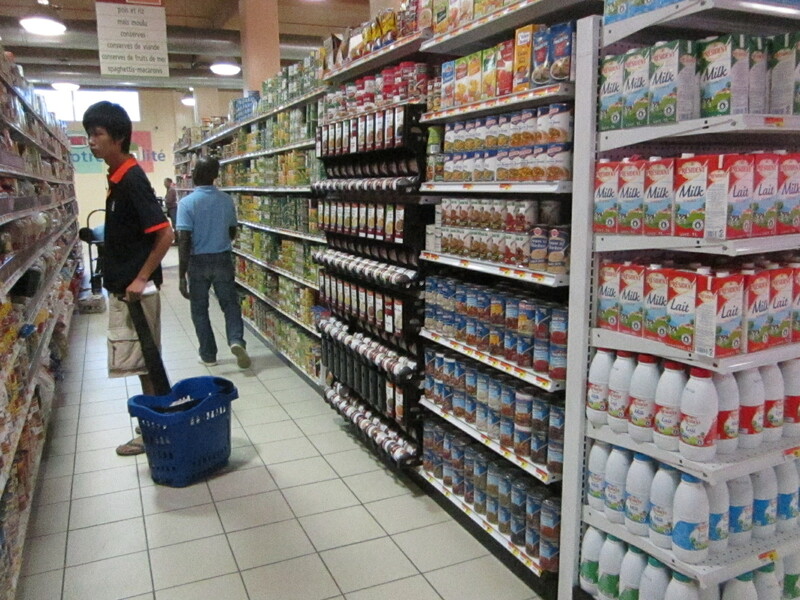 It was similar to any grocery store back at home (though with 2 floors – top floor had a liquor store and the pharmacy), and the shear size and variety of everything was overwhelming. So were the prices… used to dickering in the local market over what to pay for a bag of garlic, it was disturbing to find that one head of garlic cost the same as 20 back in Carrefour. It was the same for almost everything that we looked at, and it was with some guilt that we mentally shrugged and did most of the weekend’s shopping there. After a snack of Fudgcicles (the best you ever tasted… even freezer burnt and half melted) we left Pierre Richard and the taptap in some shade and went to wander around a little more. Going in and out of some of the most expensive shops we have been to anywhere in the world was somewhat disturbing… despite the fact that we looked like vagabonds, the mere colour of our skin granted us access. Meanwhile all we could do was shake our heads at the prices, thinking in terms of how many Haitian families could be fed/month just for the price of a shirt or a pair of shoes (or the $25,000US pearl necklace!). It was also the first time that we had been into stores where armed guards sat at the door or else you were locked in once you entered. Feeling out of our depth, we headed back out to the street to simply wander through the open stalls. Even here there was a difference, as clothing still had tags, produce was clean, other items had price tags, and there was no garbage anywhere to be seen on the streets. This is in direct contrast to the markets we have frequented, with unwashed produce (the dregs of which are simply tossed to the side), used clothing, and garbage and filth everywhere you go. It left us wondering if the people who lived in this neighbourhood ever saw the rest of their country, if they understood at all the depth of despair and hopelessness that many of the people face. 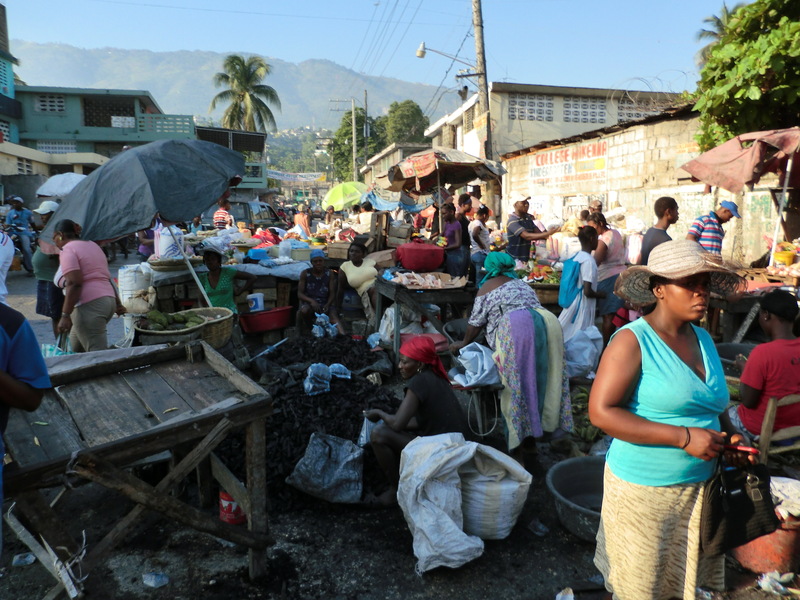 While we certainly don’t feel that we have even scratched the surface, we can at least recognise the complete and utter difference between these two groups of Haitians who live side-by-side. Hungry and a little shell-shocked, we decided to have lunch at a bistro-type restaurant. At the table beside us were two American UN peacekeepers having a pizza, and complaining bitterly that everyone wanted to speak French to them, and that hardly anyone spoke any English. While it was definitely stereotypical, it was interesting to see the difference. While we had struggled hard to be understood and learn as much as we could in order to communicate, we had forgotten that not everyone makes that attempt. 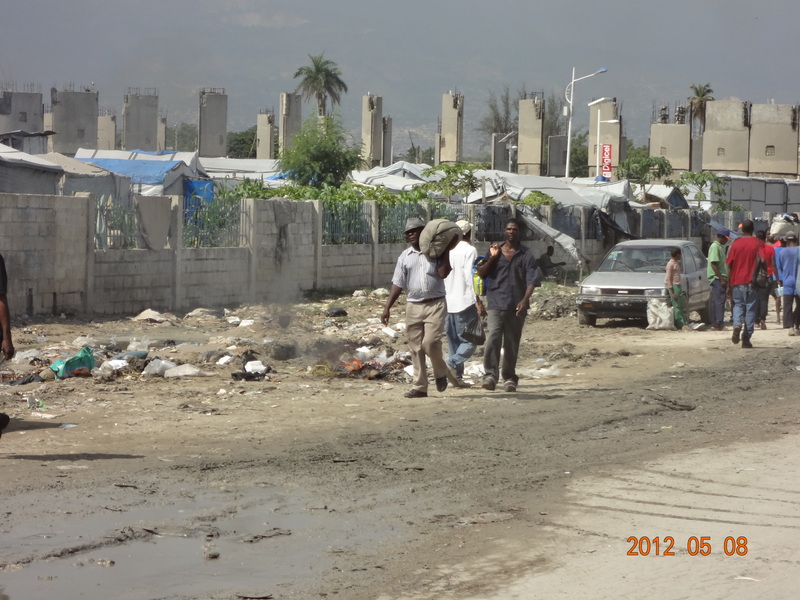 And with all of the troubles that Haiti faces, good communication is going to be required to make any sort of inroads. Feeling that our systems had enough shocks for the day, we headed back to our little area of PaP to reflect and discuss what we had seen and done over the last 2 weeks. It was only once home that we discovered that there had been a small gun-fight this afternoon… not in any area that we were close to today, but over on the edge of the city, where we had passed all of the UN vehicles on our way back in from the mountains. It had been short and brief, with the UN promptly squelching it out. It basically didn’t even affect the traffic. All of us are feeling pensive this evening, turning things over in our minds… both with regards to improvements for future clinics and trips, but also overall big picture, life concepts. Our focus has both sharpened and broadened, grown and yet become more clear. Each small step we take can make huge differences… even if it is only in the life of a single individual. It puts things into perspective. Anyway, that’s us for today. sounds like a productive trip for all involved and very worthwhile. glad you could all make it. “Each small step we take can make huge differences… even if it is only in the life of a single individual…..” A simple random act of kindness has greater potential to influence and change our world. Just imagine changing one life at a time……with the right attitude, the world will be a better place. I’m John Bick, Phillip’s long time friend and supporter. It is very kind and conscience of you to go to Haiti. 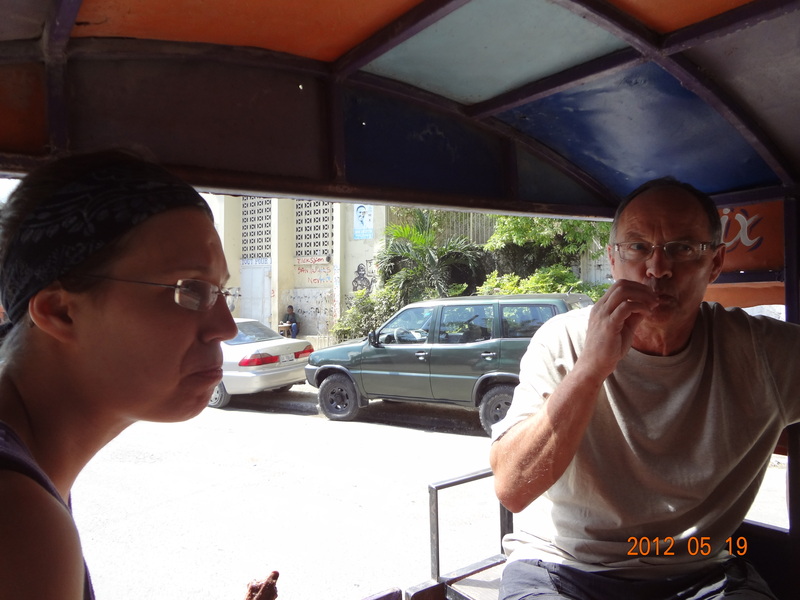 There are many people with many reasons for being in Haiti, but comfort, greed and self service are seldom among them. There are many more millions of peoples world wid and especially in the States, to whom the poor are invisable and there is no thought to the plight of the most desperate. Once I was a young desperate American, unhappy with my eight year old car, low paying job and out of date sneakers. We ate well, Linda and I, but not “out”. My idealistic friends were loosing their one world vision and their kids were becoming profesional soldiers and republicons. The talk was of war and the acquision of wealth. I ran away, as far as I could go, to Haiti. A world apart. It was there in the absence of Uncle Sam, Big Brother, and the all consuming media I found someone: me. A person who could make a difference.